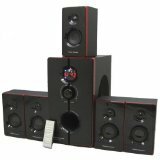 Theater Solutions TS516BT 5.1 Home Theater Speaker System is a compact, high-definition 5.1 / 2.1 switchable home theater system with built in Bluetooth that's simple to set up and use. The TS516BT features a Pro Surround channel switch to integrate all your surround formatted movies, music and games and deliver a true surround experience. The Speaker system consists of five speakers - left, center and right front channels with two rear surrounds - and one powered subwoofer. All five 2 way speakers in this home theater are identical, creating a seamless blend of sound and style. Inside each modern, high-gloss black enclosure, you'll find durable, high-quality components that will provide superior performances for years to come. Each speaker is magnetically shielded - so it won't interfere with your TV picture - and can be positioned vertically or horizontally next to your HDTV or other type of flat-panel. This home theater system's subwoofer delivers class-leading, room-shaking bass thanks to a powerful digital hybrid subwoofer amplifier and a 6.5-inch driver. Featuring a sleek black high-gloss finish, this hard-hitter also includes an at your fingertips remote, so you can customize the level of bass for your room and independently control the front, rear, and center channel speaker. Sound accounts for half of the home theater experience, whether you're watching a movie or sporting event - or even playing a video game. Your TV is only one piece of the puzzle. It's the audio that drives the action, creates the mood and brings your video content to life. So, make the TS516BT part of your home entertainment today.